A.R.Rahman, (Allah Rakha Rahman) the musical maestro of Indian Cinema was born on 6th January,1966 in Madras, to a musically affluent family. This genius with his exceptional talent, has reached heights of success that people his age can only dream of. Even then this small man remains humble and credits all his inspiration and success to Allah. Born as Dileep Kumar to parents R.K.Sekhar, a music composer and mother Kasturi (alias Kareema Begum), he came to be known as A.R Rahman later when the family converted to Islam. Dileep started learning piano at the tender age of four. As his father passed away early, the pressure of supporting the family fell on young Dileep Kumar. He is married to Saira and has three children - Khadija, Rahima and Amin. Dileep joined Illaiyaraja's troupe as a keyboard player at the age of 11 and had to drop out of school. He also played on the orchestra of M.S.Vishwanathan and Ramesh Naidu and accompanied Zakir Hussain and Kunnakudi Vaidyanathan on world tours. All this experience enabled him to earn a scholarship to the famed Trinity College of Music at Oxford University from where he obtained a degree in Western Classical Music. After he returned he continued to be a part of various music troupes. He was also a part of local rock bands like Roots, Magic and Nemesis Avenue where he performed with his future colleagues like Ranjit Barot and Sivamani. In 1987, he got a chance to compose a jingle to promote Allwyn's new Trendy range of watches. His work was appreciated and he got many more offers. He has done jingles for popular ads like Parry's, Leo Coffee, Boost, Titan, Premier Pressure Cooker, Asian Paints etc. Rahman went on to compose more than 300 jingles and received awards and recognition for his work, in the five years he continued in advertising. In 1989, he started a small studio of his own, called Panchathan Record Inn, attached to his house. It was here that he began experimenting in sound engineering, design and production. The turning point in his life was when he met the famous director Mani Ratnam and was signed on to compose music for his super hit film 'Roja'. 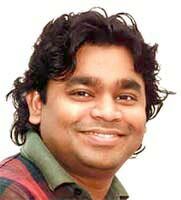 Rahman got the national award for the best music director that year. From then on there was no looking back for him. He got offers from a lot of directors from the south and the Hindi film 'Rangeela' and later 'Bombay' established his popularity in the north too. Rahman music wave arrived with a big bang in the tinsel world with sales of more than 40 million albums over a period of 3 years. He has also dabbled in playback singing with songs like 'Hamma Hamma' in Bombay, 'Dil Se Re' in Dil Se etc. Apart from making music for films, Rahman has also done compositions for patriotic albums like ' Vande Mataram' a tribute to the motherland released simultaneously in 28 countries across the world and 'Jana Gana Mana' which brought together many of the countries classical and contemporary musical maestros, both released under the prestigious Label of Sony Music. He has also worked and performed with internationally reputed artists such as Apache Indian, David Byrne, Michael Jackson and with Andrew Webber Lloyd for his album 'Bombay Dreams'. Rahman continued to record frequently in his studio, the Panchathan Record Inn till 2005, after which he shifted to his new studio named as A.M. Studio, which is considered to be the most developed, equipped and high tech studio of Asia. In 2006, Rahman launched his own music label, KM Musiq and its first release was his soundtrack to a tamil film Sillunu Oru Kaadhal which it released worldwide, in August 2006. He has received numerous awards in recognition of his talent. Padmasree from the government of India in 2000 being one of them.